Posted on Monday, February 25th, 2019 at 5:33 pm. We’re extremely grateful to our main sponsor: Pride Cymru. Without their support we wouldn’t be able to continue to do BiFest Wales. We’re looking for stall holders and sponsors during the day. We also need raffle prizes, workshop runners, printing, Welsh translation, volunteers for the day, and people to help promote the event. Details of ways you can get involved and help out are here. You can also email: bicymru@yahoo.co.uk or message Ele Hicks on Facebook. Details will be added to the daytime and evening event pages as they’re confirmed. If you would like leaflets or posters for the event you can download them here or contact us and we’ll send them to you. Posted on Monday, August 27th, 2018 at 5:19 pm. Bi Cymru/Wales and Bi Pride UK had a great time at Pride Cymru. We had a great group on the parade and spoke to around 250 people on the stall. 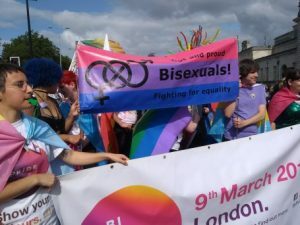 People loved the stickers and a lot of information was given out about Bi Pride UK on 9th March 2019 in London and the local Bi Cardiff and Bi Swansea groups as well as BiFest Wales. The Sunday was a wash-out, but the Saturday was great. 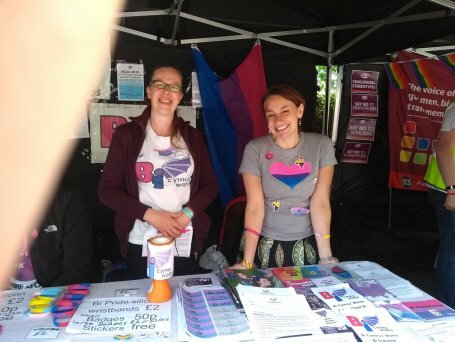 We also sold a lot of bi and pan pride wristbands and badges. It was great to meet everyone on the parade and the stall. Contact bicymru@yahoo.co.uk if you want to know more about the groups in Wales, BiFest Wales or our training. 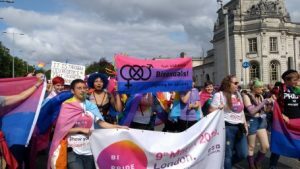 You can also email us to join our mailing list or become a member or with your plans for Bi Visibility Day 2018 on 23rd September. Posted on Monday, August 27th, 2018 at 3:56 pm. Bi Cymru/Wales are looking forward to Bi Visibility Day. Bi Visibility is the biggest and most important date celebrating bisexuality and challenging biphobia and bi erasure every year on 23rd September. It’s the 20th annual Bi Visibility Day this September 23rd. The date highlights bisexuality and the challenges posed by biphobia and bisexual erasure, as well as celebrating the work of a growing number of local, national and international organisations around the world which champion bisexual visibility and equality. We’d love to know and support your plans for the day. Post your events and find out more at http://www.bivisibilityday.com/year2018/ and email bicymru@yahoo.co.uk with your plans. We can also send you resources and information on local groups and events in Wales. If you’re an individual who wants to show your support for bi visibility take your photo with the bi pride or pan pride flags or with other bi or pan themed slogans and post it on social media on 23rd September using #bivisibilityday. 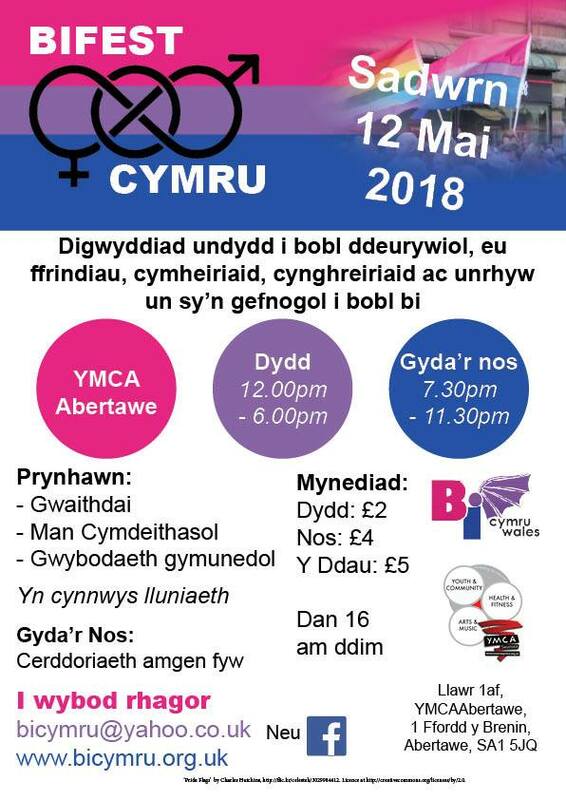 We’d also love it if you could share your photos from Wales with bicymru@yahoo.co.uk or on the Bi Cymru/Wales, Bi Swansea or Bi Cardiff Facebook groups. Posted on Friday, August 24th, 2018 at 3:56 pm. 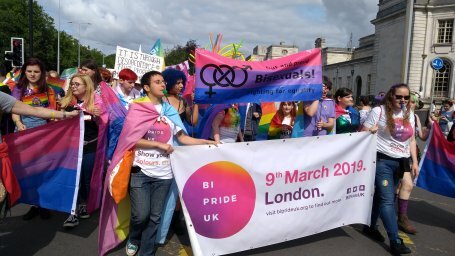 Bi Cymru and Bi Pride UK wish you a happy Pride Cymru. We’re also looking forward to having a stall behind the Museum and City Hall on the day and welcoming lots of people. Posted on Friday, May 4th, 2018 at 9:34 pm. Open to all ages. Under 18s must be accompanied by a responsible adult. Some lyrics are unsuitable for young children. Parental advisory. DJ Ferocious Kitten – an alternative DJ playing the best in EBM, Industrial, Goth, Rock, Metal & everything in between between acts to keep you dancing! Posted on Wednesday, May 10th, 2017 at 2:11 pm. Live music event and DJs in the Theatre (main BiFest room) – Alternative gig with Catherine Elms (dark cabaret singer-songwriter-pianist); Captain Meatshield (YouTube gamer and musician metal covers of game themes); and DrakenWerks (Welsh dark electro / industrial) with DJ DarkDragon between acts. Norena Shopland from Draig Enfys LGBT Welsh history project . From the earliest times to the present there have been famous bisexual people in Wales. Who were they? Come and hear their fascinating stories as Norena Shopland introduces you to some people from Bi Wales’ past. A fun, interactive workshop, which will look at how people identify themselves beyond their sexual orientation. Where do you fit into the bi community? Do you feel alone or that you’re not the same as everyone else? This session will allow people to find other people with similar interests and make friends. Dynamics of domestic abuse are becoming more understood, especially around non-violent types of abuse and coercion and control. However this is still based around heterosexual and usually female victim models. How does sexuality factor in domestic abuse experiences? What types of abuse are particular to bisexual victims? What help is available and how can we improve professional understanding? 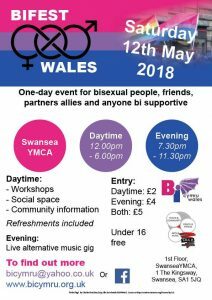 This workshop will discuss ways you can get involved in the Bi community in Wales and how we can make it better together. Roles discussed include making local groups happen, getting involved in BiFest Wales 2018, helping out at stalls and events, and a variety of areas from design and translation to talking to others. Suitable for all ages. Get together and make a fun cat ears or floral headband at the craft table. Instruction and guidance and materials provided. Donations welcome towards materials, but not needed. This is an interactive workshop, which has been run several times before very successfully. 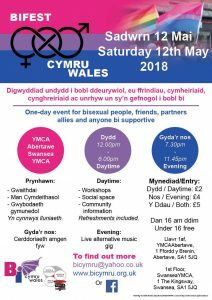 This workshop explores the reactions to bisexuality from both the gay and straight communities and looks at how different people cope with being bisexual in a world that is often viewed as either gay or straight. This is your chance to say how it is for you and hear from other people. Posted on Saturday, May 6th, 2017 at 5:51 pm. We’re pleased to announce that Captain Meatshield and DrakenWerks will be joining Catherine Elms performing at BiFest Wales in Swansea YMCA on Saturday 13th May 2017. Captain Meatshield is a one-man metal-covers project, with a strong passion for the geeky side of life. A life-long love of Sci-Fi, Fantasy, gaming, and music has led to the formation of a YouTube channel dedicated to “Let’s Play” gaming content, and heavy, symphonic metal covers. While the gaming side of things tends to stay at home, Captain Meatshield wants to bring the music out to the public, and with covers of popular gaming themes from Final Fantasy, Duke Nukem, and Undertale, along with film and TV themes from Thunderbirds, Star Trek and The Nightmare Before Christmas, There should be something to appeal to everyone’s tastes! 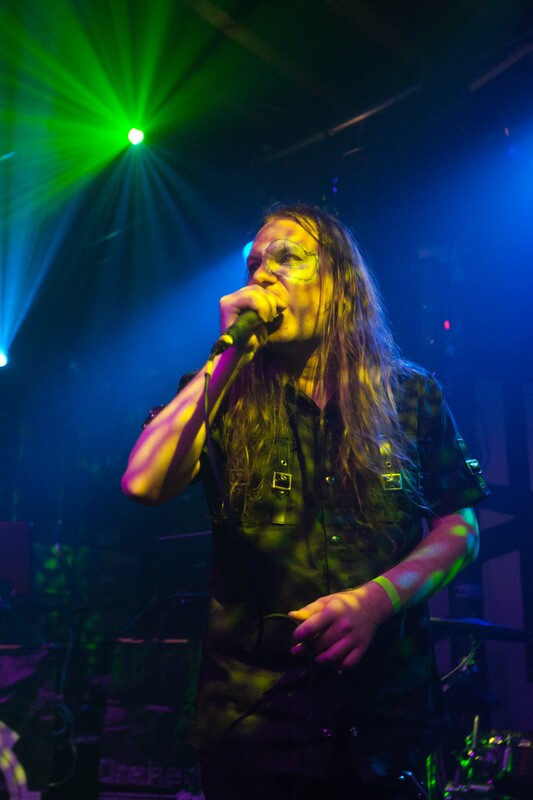 A Dark Electro / Industrial act from South Wales in the UK, DrakenWerks have risen to prominence in the last year. The brain child of promoter and DJ Draken, their last album, No Prisoners, went straight to number 2 in the German Alternative Charts and remained the maximum 8 weeks stay in the top 10 and their tracks have been tearing up dance floors and radio set lists since then. They have also played across the UK, supporting acts such as Assemblage 23, Aesthetic Perfection, 3 Teeth, Youth Code, Mortiis, Clan of Xymox, Alien Vampires, V2A etc… and recently begun playing outside of the UK, starting with supporting Leaether Strip in Madrid, Spain, earlier this year. Also, later this year, DrakenWerks plan to release their second album, Age of Inofrmation along with a number of preceeding singles including a track mostly performed in Welsh. DJ DarkDragon dusting off the mp3s after an extended break. Previous DJ at Unleashed with a penchant for all things rock and goth. playing goth, rock, and industrial music between acts to keep you dancing! Catherine Elms is an unsigned singer/songwriter and pianist, whose music combines heavy rock, dark cabaret, emotionally-charged melodies and impassioned lyrics. A self-taught non-classical pianist, Catherine’s raw and evocative playing style lies directly between the brash power of PJ Harvey and the baroque pop-rock of 1990s Tori Amos. Her music possesses a dark intensity with softly defined edges: both introspective and spirited. Described as “dramatic” (Buzz Magazine), “adventurous” (The Flux), “fragile and fierce” (Off The Radar), and “haunting” (South Wales Evening Post), Catherine is a rising artist in the South Wales music scene driven ever forward by a growing loyal fanbase. Posted on Saturday, April 29th, 2017 at 1:31 pm. 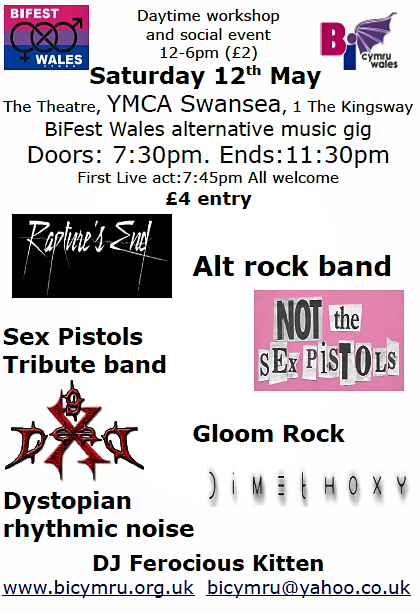 We still have one slot for an alternative live music act for BiFest Wales 2017 on Saturday 13th May. 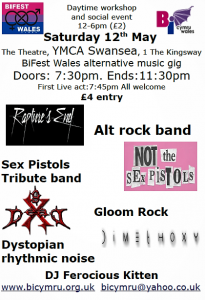 If you’re a solo act or group playing rock, metal, punk, EBM, goth, industrial or any other alternative music and want to play please email bicymru@yahoo.co.uk as soon as possible. We can reimburse travel expenses from South Wales and want to promote all acts on our website, FaceBook and Twitter in the next week. We also have one slot for a bi-related workshop and one slot for a social, fun, or getting to know you style workshop. If you have any ideas and want to offer a workshop please email bicymru@yahoo.co.uk as soon as possible. The full workshop timetable and details of live music acts will be on this website and FaceBook next weekend (8th May).